Matrix Reloaded, the second film in The Matrix trilogy, kung-fu’d its way into theaters 13 years ago this month. The conclusion, The Matrix Revolutions, followed in November of the same year. But our favorite is still the original, when we’re first introduced to Neo, Morpheus, and the truth about spoons. 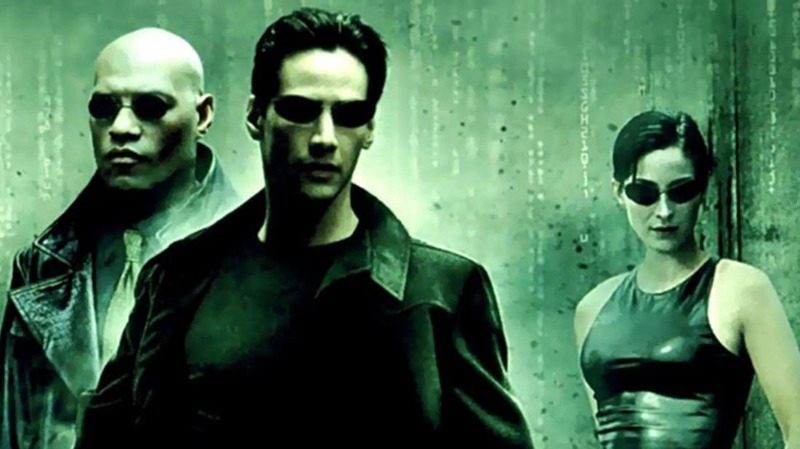 Here we go down the rabbit hole to the stories behind 14 mind-twisting terms from The Matrix. “The Matrix has you,” Neo’s computer tells him. What is the Matrix exactly? In the movie, it’s a virtual reality (VR) world into which people are plugged while their bodies are used for energy by a race of artificially intelligent beings. The matrix as a VR-world might have first appeared in the 1984 novel by William Gibson, The Neuromancer: "He'd operated on an almost permanent adrenaline high ... jacked into a custom cyberspace deck that projected his disembodied consciousness into the consensual hallucination that was the matrix." Neo has a couple of meanings. It's an anagram for "one," as in the One who will save humanity, and also means “new” as in the new, freshly-born person now aware of the Matrix. The name Thomas Anderson also has significance. Thomas comes from an Aramaic word that means “twin.” Agent Smith tells Neo, “It seems that you have been living two lives,” one as program writer Thomas Anderson and the other as hacker Neo. Thomas might also refer to doubting Thomas, the apostle who refused to believe in Jesus’s resurrection until he fingered the wounds himself. As for Anderson, it means “son of man,” perhaps to emphasize Neo's humanity. Metacortex is the software company that Neo works for. Meta- is a combining element that means “changed” or “higher, beyond.” Cortex refers to the outer layer of an organ, in this case the brain. Metacortex could imply the idea of a higher intelligence, like that of robots and computer programs, or a higher consciousness, like that which Neo achieves in order to realize the true nature of the Matrix. The word trinity is commonly thought of in the Christian theological sense of the existence of God in three persons. Morpheus, Neo, and Trinity might be considered embodiments of those three persons, with Morpheus as the Father (“Morpheus, you were more than a leader,” Tank says, “you were a father”), Neo as the Son or Christ-like figure (“You are my Savior, man!” Choi tells him, “my own personal Jesus Christ!”), and Trinity as the Holy Spirit who helps Neo come back from the dead. Neo’s computer advises him to “follow the white rabbit,” a reference to the tardy rabbit which leads Lewis Carroll’s Alice down the rabbit hole and to her adventures in Wonderland. In the film, the white rabbit appears in the form of a tattoo on the shoulder of a woman, who Neo follows to a club where he meets Trinity. While the OED’s “official” definition of white rabbit is a person or thing that hurries from place to place, it might also refer to something that leads one on (mis)adventures. In the 1930s, rabbit hole gained the figurative sense of a passage leading to a surreal or nonsensical place. In ancient Roman poet Ovid’s Metamorphoses, Morpheus is the god of dreams while his name translates from Greek as “maker of shapes." In the film, Morpheus is a legendary hacker who expertly manipulates the Matrix and helps Neo realize the Matrix is basically a dream. An influence on the blue and red pills of The Matrix might have been Douglas R. Hofstadter’s 1979 book, Gödel, Escher, Bach: An Eternal Golden Braid, in which a tortoise and the philosopher Aristotle drink phials of blue and red liquid to “pop” in and out of M.C. Escher’s labyrinthic drawings. The drinking of the phials—like the taking of the pills in The Matrix—is reminiscent of Alice’s drinking a bottle labeled "DRINK ME" and eating a cake tagged "EAT ME," which cause her to shrink and grow, respectively. In Matrix parlance, redpills are those who are aware of the Matrix construct while bluepills are not. Morpheus’s ship, Nebuchadnezzar or "Neb" for short, is named for Nebuchadnezzar II, the ancient Babylonian king who was said to have troubling dreams he couldn't remember. In Matrix Reloaded, Morpheus quotes the Bible as the Neb is destroyed: “I have dreamed a dream; but now that dream is gone from me." Zion is the last human city, says Tank, hidden “deep underground ... near the earth’s core.” Like the Matrix, the idea of Zion might have been plucked from The Neuromancers, in which Zion is a space settlement built by Rastafarians. The original Zion was an ancient Hebraic city often used as a synonym for Jerusalem. The Oracle is a sentient program, but unlike the Agents, is on the side of the humans. She’s believed to be precognitive, but it’s unclear if she’s simply telling people what they want to hear. The name Oracle could be a play on the Oracle computer company. Cypher is a Neb crew member furtively in cahoots with the Agents. The word cypher, or cipher, has multiple meanings. Its oldest definition is the numeral zero, and perhaps by extension, a person of little worth. Cipher eventually came to mean any number, and then a disguised way of writing, perhaps because early codes often replaced letters with numbers. In the movie, Cypher is an expert at reading Matrix code and is himself coded or disguised. Matrix digital rain is the code for the Matrix that rains down on various computer screens. The characters are a combination of Latin letters, numbers, and Japanese katakana characters. The Hungarian film Meteo is said to be an influence, as well as the opening credits for Ghost in the Shell, a Japanese anime film based on the manga of the same name and an influence on the film in general. While this special effect didn’t originate with The Matrix, the term bullet time might have. A March 1999 Variety article about the movie mentions “bullet-time photography,” in which “ultra-fast lensing” is used in combination with “computer enhancement” to alter “the speed and trajectories of people and objects.” The first instance of bullet time (not-so-)special effects might be in the 1962 movie Zotz!, in a which a nutty professor uses an ancient amulet to stop a bullet. In wire fu, a blend of "wire" and "kung fu," wires are used in fight scenes to give the illusion of flight. While the term first appeared in the mainstream in 1997, says Word Spy, Hong Kong action star Jet Li is credited with pioneering the technique in films such as Once Upon a Time in China.